This last week has been crazy at work and extended into the weekend. I did get the chance to hop into the game, set my training queue (I've completed Metallurgy V on my industrial alt and am about to finish Science V on my main), and jump into my implanted clone after the end of the war, but that was about it. But work wasn't the only reason for my lack of time in game. And no, this isn't a post complaining about getting kicked out of the game due to the database failover Saturday morning. The guy who got me into MMOs and World of Warcraft started playing Dungeons & Dragons Online. I started with pencil and paper D&D over 30 years ago and the thought of going back to that, especially now that DDO is a free-to-play game, was intriguing. So I downloaded the game and rolled up a rogue just to check it out. And then I found out that one of the programmers at work not only had started playing DDO also, but was leaving the company at the end of the week. Now, one of the good things about playing MMOs is a chance to keep in touch with people. And MMOs are usually better when played with others. I found that to be the case with both EQ2 and Eve. So having a group of real life friends in a game made the decision easy. Especially since no one would have to roll up a character they didn't want to play since I was playing a rogue and the others were already playing a barbarian and a cleric. I've been catching 20 minutes of game time here and 30 minutes there. Not really enough time to get into Eve, but enough to get something done in the DDO starter village. The others were going to play Saturday afternoon for a couple of hours, but I couldn't join them. I'm really ready for work to slow down a bit. At least I'm catching up. I'm now up to level 2 and the others are at level 3. I still have to figure out if I want to buy a Cyclone or a Hurricane in Eve (I've now got the isk to buy either one) but now I can look forward to getting some clothes and armor for an avatar again. I'm surprised how much I missed that. I got home from work late Friday night so I did not get to hear BC Hastings' and The PitBoss' lecture on high-sec wars last night. As I half-way expected, we received a wardec from Privateer Alliance after the lecture. According to our CEO Kelduum Revaan, this war is a practical follow-up to the lecture! So we have proof that the Uni leadership will arrange wars. But why not; at least the Privateer's fight. So I started to go through my personal checklist of what to do in the 24 hours leading up to war. 1. Get back to Aldrat, my home system. I need to delete this one. I've got jump clones now and I have one stationed in my war base in Aldrat. But I was tired, cranky and not thinking straight. Part of the reason for making this post is so I have something. So I went back to my primary missioning base (yes, I have two pairs of Ruptures/Thrashers I use for missioning) and then jumped to a clone I still had in Lonetrek. Eve University can get jump clones from the Wiyrkomi Peace Corps and I still had one out there. This was a perfect time to retrieve it. 1. Check to make sure my medical clone is up to date. This is very important. I checked my character sheet and I was 1.1 million skill points under my clone capacity. 2. Transfer all items I wanted to sell to my economic alt. I'm pretty bad about selling things like salvage. I'll let it build up for a week or two before giving it to my economic alt. Wars are a good reminder for me to do so. 3. Check skills training plan. I usually try to make sure I have all the skills training books I'll need for the next week. And sometimes I'll make an adjustment to the order of skills I want to learn. For this war, I was training Logic IV when the Evemail from CONCORD arrived. I was going to train Advanced Weapons Upgrade to III after that. I changed the order in my planning queue in Evemon to train Advanced Weapons Upgrade first, bought the book I needed, and started training. I was able to finish training levels 1 & 2 before the war began. 4. Check ship equipment and ammunition. The period before a war is a good time to make sure your equipment is up to date with your new skills and that you have enough ammunition and drones. I decided to upgrade the electronic warfare and related modules on my Bellicose to T2 (target painters and sensor booster) as well as the damage control module. I also abandoned the Bellicose CL-B weapons mix I had before to a short-range (< 40km) mix of 650mm Artillery Is and Compact 'Limos' Assault Missile Launchers. I also transferred enough ammunition to my base to last at least a week. 5. Update bookmarks. In a war against Privateer Alliance, having updated bookmarks, at least in your home system, is a good thing. I didn't really have enough bookmarks created before the last war, so I spent some time make some more based on some of the conversations I read in corp chat. The two most popular topics of conversation lately have been about bookmarks and bacon. I'm not sure why. 6. There is no six. D'uh! 7. Loading war targets into "Buddies" list. The intel departement developed a list for the last war and sent an update last night. I spent some time loading the updated list into my buddies list. The buddies list is a very convenient way to keep track of war targets. I think I'm ready for the upcoming war. Or practical exercise following Friday's lecture. 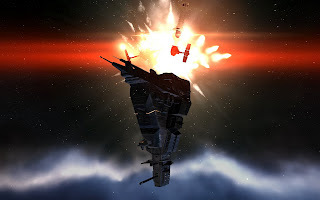 Mynxee, the CEO of Hellcats and the author of the Life In Low Sec blog speaking on piracy in Eve. Garr Anders, the Minmatar faction warfare corporation Thukk U's director of operations on Faction Warfare. weel barrow of Against All Authorities giving lectures titled "Logistics in Large Fleet", "Market PvP", "From Tackler to Titan", "Account Balancing" and "Multi-language Environments". Yes everyone, weel barrow is alum of Eve University. Aralis, the CEO of Curatores Veritatis Alliance (CVA) on running a Not Red Don't Shoot (NRDS) organisation in nullsec. Reiisha, an alum of Eve University, on the history of Eve. BC Hastings, CEO of Privateer Alliance and The Pitboss, the CEO Privateer Alliance member Interstellar Brotherhood of Gravediggers, on "War in Empire Space" and running a war-focused group. Rodj Blake from PIE Inc.
Wow! Leaders of AAA and CVA participating in the same event. The leadership of the Privateer Alliance being allowed into the halls of Eve University without shots being fired. Minmatar and Amarr roleplayers coming together to talk. And I haven't even mentioned the space-borne activities because I don't want to give away any intelligence on possible fleet movements. I've been to several gaming conventions over the years and the line up of speakers that Kelduum and his staff have put together rivals anything that I've attended in the past. I'm really looking forward to the next week in New Eden. As my corpmate Arukemos pointed out on his blog, @Xiphos83 announced a contest on CrazyKinux's blog looking for screenshots that can be used as the desktop image on a computer. Now, I'm not going to enter the contest, but I thought I'd use it as an excuse to post a couple of my favorite screenshots. The first is a screenshot I have actually used on my computer at work. This one features my Mammoth, Ice Cream Man, engaged in a mining operation in a dead space zone. I liked the way the Retriever in the background flown by my alt looks like a painting. I actually had someone who is the opposite of a gamer girl complement me on the shot. The Ice Cream Man is kind of special to me because it is the ship I flew in Eve University's takedown of 2 Dynaverse Corporation player-owned stations back in November. The next screenshot is from the pilgrimage I made to New Eden and the Eve Gate. I really should finish the post I started writing about my trip because we received a big assist from ANZAC Alliance. And when I mean big, I mean REALLY big. One of my favorite shots is my Rifter flying in front of one of the Avatars that provided the jump bridge the Unista fleet used to get to the New Eden system. To give a perspective on the size of an Avatar-class titan, the Rifter is the size of a 747. The final screenshots that I've thought about using as a desktop background are from a nameless mission whose name I've forgotten. As is common, the goal involved destroying a large facility. I've been torn between the two shots of my Rupture departing the area. I'm not sure which one is the best, so I'll include them both. In the first, the station is still visible while the second is full of pretty colors. Real life has been so hectic that I haven't been able to log into the game to do more than update my skill queue for the last 3-4 days. But I really need to mention last weekend I finally got on my first two killmails Saturday night/Sunday morning. I'm the Bellicose pilot who did 0 dps. But what do you expect? I'm a target painter, not a killer. Neither rain nor slow nor a wardec by the Privateer Alliance will keep the students of Eve University from their studies. But I still was pleasantly surprised when the Wormhole 101 class went on as scheduled yesterday. Our instructor was Automa from Everset Dropbears, a corporation formed from the members of Eve University's now defunct wormhole program Division 6. The last is important for Unistas because wormholes are the only PvE content that students can do during a war. 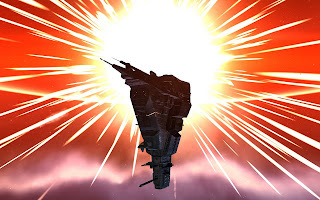 But anyone going into a wormhole is assumed to be going into a PvP area so wormholes require the same type of fleet that form during wartime conditions. For those who don't know, wormholes are kind of like jump gates, except that there is no gate surrounding the jump point. Oh yeah, and your ship is going into null sec space. And that pilots must be careful, because the wormhole might not be there when you pass through. And when the wormhole reappears, you won't know where you will end up. But besides that, just like a jump gate. 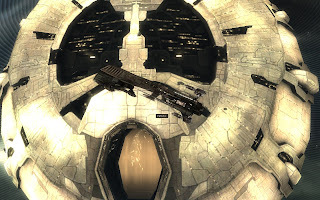 CCP is not totally heartless about wormholes and gives clues to the stability of the wormhole. That's why pilots should have the link to Allakhazam available; the page has the codes for what each phrase means when you "show info" on a wormhole. The third line indicates the amount of time the wormhole will naturally exist if no one collapses it by moving ships through it. This wormhole is beginning to decay, and probably won't last another day. (16 to 48 hours). The last line describes how close to the wormhole is to hitting the limit of the total mass that can pass though it. After checking out the wormhole, if you want to go into it, create a bookmark and then enter. Upon entering the wormhole, you have up to 60 seconds cloaked as long as you don't move. During that 60 seconds you can do the following. Look on your overview for ships. If there are ships around, the wormhole probably isn't safe and retreat may be the best course of action. Use the directional scanner to see what is in the system. You may find some interesting things. The class found a POS. Fortunately for our little pod fleet it was unoccupied. Look up the system in Dotlan. The system is in the upper left-hand corner by your name, so just insert that in the link to see what is in the system. Click here to see the system we entered. There is a lot of good information. Finally, if the system is one you want to explore, bookmark the wormhole. If you don't want to explore, just exit. Gravimetric - regular mining, but since wormhole systems are 0.0, pilots will find the null sec asteroids. There is usually only an initial spawn of 3-6 Sleepers that appear approximately 20 minutes after the first ship arrives at a gravimetric site. Ladar - gas harvesting sites, but better because the gas is used in T3 production. There is usually only an initial spawn of 3-6 Sleepers that appear approximately 20 minutes after the first ship arrives at a ladar site. Radar - hacking and code breakers required. There are usually 4 waves of 4-8 Sleepers. Magnetometric - archaeology & salvaging required. There are usually 4 waves of 4-8 Sleepers. The above mentions Sleepers. What are called Sleepers are really drones. Very nasty and powerful drones. Sleepers have an omni-tank with 70% resists across the board, do omni damage, hit hard, will probably be faster than you, will scram and web you and, at higher levels, are prone to remote repping and having gun batteries. Sleeper tactics are also more advanced than that of the regular NPC ships/drones in k-space. Sleepers see drones as a major threat so will always attack them unless something like a group of RR battleships are around. Gallente ships will have a hard time soloing in w-space without their drones. Sleepers also see electronics warfare modules and remote repair as major threats. So remote repping battleship groups can draw aggro and allow the rest of the ships and drones in a fleet to attack Sleepers virtually unmolested. Oh, one other important item of information about Sleepers. They do not attack pods. So for the class, we flew from Aldrat to the site of the wormhole opening. The trip wasn't far, but we were at war with Privateer Alliance. Thankfully they did not have any of the local systems picketed so our fleet with (I think) 38 pods was unmolested. So what should a pilot thinking of engaging in wormhole operations possess? According to Automa, a pilot should have trained Astrometrics IV, Astrometric Pinpointing III, Astrometric Rangefinding III and Battlecruiser IV if flying a battlecruiser. In addition to fitting a tech 2 tank on your ship, a core probe launcher (and preferrably a Sisters Expanded Probe Launcher) is a good idea in order to get out of the wormhole if the exit closes behind you. Getting all resists above 70%. Your ship needs to match the capabilities of the Sleepers. Buffer tank. You need to be able to absorb the alpha strike of the Sleepers. They hit HARD. Self-repair. You don't want to leave the wormhole once inside. The best scouts are, as could be expected, covert ops ships, although the tech 1 frigates with scanning bonuses can also be used. The salvaging role requires a ship that not only has enough high slots to fit some salvagers and tractor beams but a large cargo hold as well. Hurricanes are very good for this role. DD (known as DPS in other games) is pretty self-explanatory, although ranged damage is best. Drakes are currently the best battlecruiser for this role. And finally support is for logistics, like repairing ships during and after fights. Note: Any errors in the above are probably a result of bad note taking on my part during the class and not the fault of the instructor. I saw this in corp chat last night. This is the truth. If you "smack" in WoW people add you to ignore list and avoid your Guild. 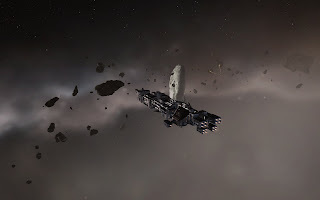 If you "smack" in EvE people add you to their friends list and wardec your corp.